Customer Service is, in today’s competitive marketplace, often the primary differentiator. Re-position your Brand's, Products' or Services' Perception to gain new competitive advantages thanks to our Customer Intelligence Platform. Long before a potential customer enters the sales funnel, Reputation Aegis gives Brands and Companies the ability to establish credibility. When the Platform collects a positive Feedback from a Real Customer, it is heavily promoted across ALL available channels: Offline and Online. Awareness can be a major barrier when trying to influence purchase decisions. Reputation Aegis helps improves Awareness and Trust in your Brand, Products or Service through Marketing and Promotion of your 5-star Customer Experience. Inform potential buyers how your Products or Services are rated by Real Customers and increase conversion rates. Ratings and Reviews are the most valuable social content you can create! Increase buyers’ confidence when it matters the most: at the moment of purchase. Retain more customers, let them refer more business to you as well! Reviews are a leading indicator of consumer repurchase intentions & loyalty. As a Customer Intelligence Tool, Reputation Aegis will help retain more customers (and save money in the process) by focusing not just on getting the sale, but creating an experience that makes your customer want to come back and even refer more business to you as well! Evolve your Business Processes, Make Business Decisions quickly and Increase your overall Competitiveness thanks to Reputation Aegis. Improve Overall Customer Experience by quickly identifying areas that need improvement in your Products or Services. By gaining Feedback from individual customers, you can follow up with those that are less than fully satisfied, improve their experience and hopefully increase their likelihood to continue to shop with you. Reputation Aegis is Search Engine Optimised! Market your 5-star Customer Experience in Search Engines thanks to Rich Snippets & Structured Data. Include fresh information from Real buyers inside your web properties (Company website, Social Network Pages...), where search engines can see it, and buyers can find it! An unhappy customer tells between 9-15 people about their experience, and 13% of unhappy customers tell over 20 people! 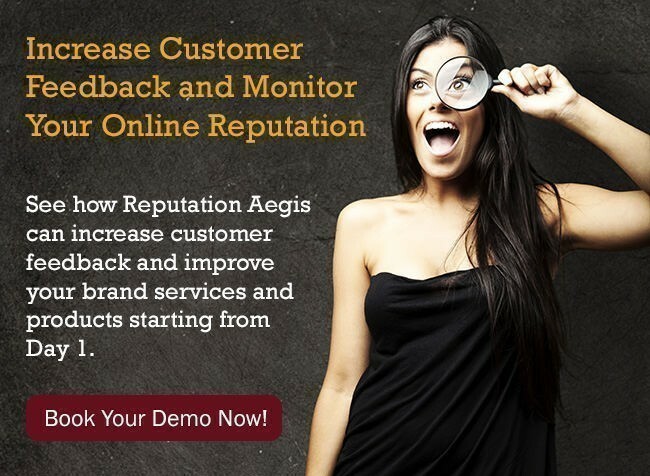 Eliminate Bad Word of Mouth by measuring Customer Satisfaction on an ongoing basis: Reputation Aegis let's you do it! Reputation Aegis creates a Powerful Shield on top of your Business or Brand. The more Feedback you collect from Real Customers, the less likely you are to suffer, in the future, from a Reputation Crisis.